Another retail listing has appeared for Spyro Reignited Trilogy on Nintendo Switch, giving us even more reason to believe the game is surely on the way to Nintendo's hybrid machine. 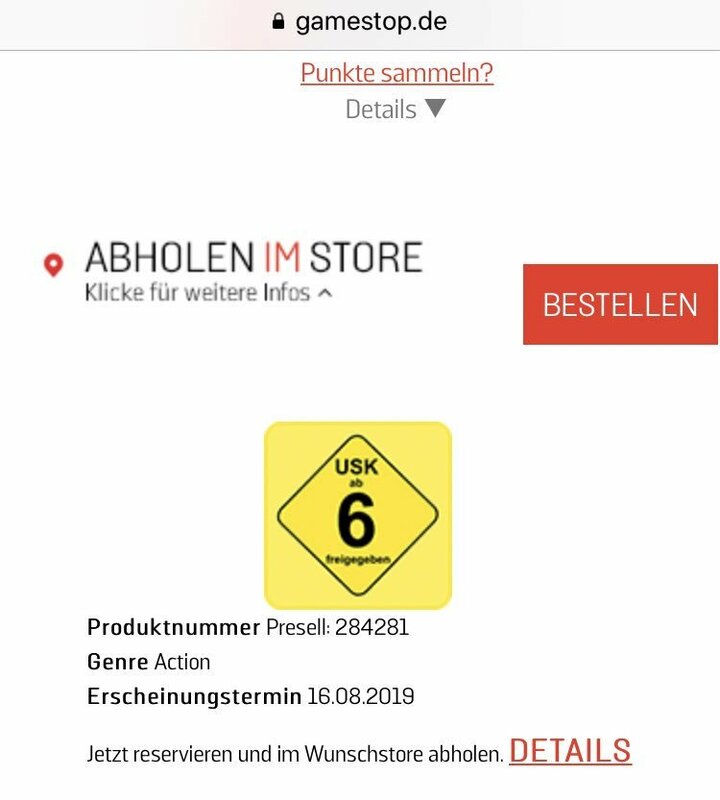 As spotted by Twitter user @AngrySpace, this listing appeared on GameStop's German website, indicating that a Switch version of the game is scheduled to launch on 16th August this year. SpyroUniverse grabbed a couple of screenshots of the listing below, which was previously available to view right here. Now, clicking on that link simply takes you to the store's home page, indicating that the listing has since been removed. In case you weren't aware, the recent Spyro trilogy released on Xbox One and PS4 back in November last year with no Switch version in sight. 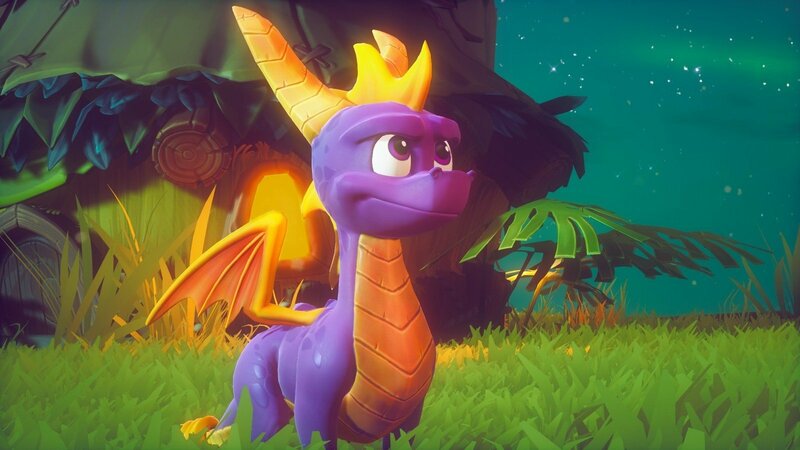 Right up until release, everyone and their cute, purple dragon believed that the game would be coming to Switch, too, mostly thanks to a listing on Nintendo's very own website and then another listing on the official Spyro site. It doesn't really get much more concrete than that, but both of these listings were quickly taken down after being spotted. Despite these apparent confirmations, though, the game still hasn't been officially revealed for Switch. We asked publisher Activision for comment near the game's release and received a very standard, nothing-to-announce-style answer in response. 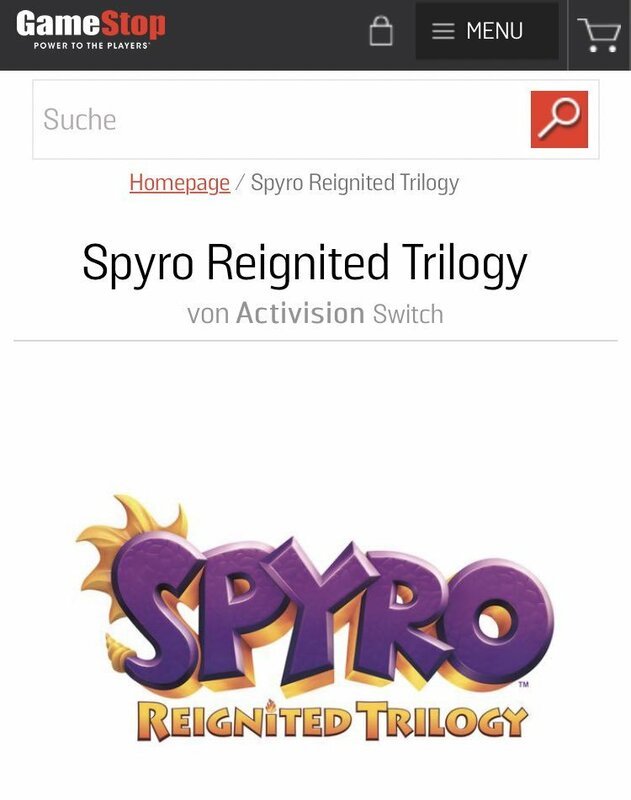 If the game had only been listed on the sites of external retailers, we'd still be rather sceptical, but we still can't get over the fact that a Switch version was shown on the Nintendo and Spyro sites last year. It must be coming, right? The worst kept secret in gaming history? Or just a lot of wishful thinking? Let us know in the comments below. It's inevitable at this point, always was. Just wish it was day one with other consoles and not treated like second fiddle on Switch anymore. Yeah.. not really interested anymore. This leak, the Official Nintendo Store UK leak, heck it was even listed for pre-order on Activision's official Spyro minisite at one point. I seriously hope it is real. I don't have a PS4 or Xbox One, but I desperately want to play the Reignited Trilogy. Hopefully my patience will pay off and I'll be playing it on Switch later this year! Let's wait until 13 Feb 2019 to see if the rumour will comes true. For people saying it is too late, your loss, as I will be enjoining it on the go. For PS4 and Xbox One only the first game and couple of levels of the 2nd and 3rd are on the disc. Can you imagine the required download for the Switch? I hope this is real, never got round to playing the original but have always wanted to. If anyone double dips on this I will shoot them. By all means buy the Switch version, but not if you already got the PS4/XB1 version. This nonsense has to end. @gcunit why do you care if people double dip? Wouldn't be at all surprised but what I can't understand is why it wasn't released at the same time as the other versions. Skipped on XB1 because of the Nintendo UK Store leak and Crash announced for Switch last year. @kobashi100 Probably because double dipping is why games are being released later on Switch. Probably pulled for an unsurprising Direct reveal. If people keep predicting the direct date someone is bound to be right sooner or later (hopefully sooner). Nintendo have had a slow start to the year. But i am hoping they don't think with 3 third party games coming to the switch before summer they don't need a direct at all that would be horrible. the 3 are mortal kombat 11, crash racing and sonic racing. I’ll be there day one, assuming the entire game is included on the game card and not relegated to a massive additional download. I'm sure it will be released at some point, just wonder why the delay for the Switch version? It will be interesting to see Crash game, apparently, coming in June and then, again - apparently, coming in August. Also, I wonder how much the sales would be (for better or worse) if this game was released along with the other platforms. I'm sure it didn't help the Switch platform as many players probably purchased the game already on PS4 or Xbox. If the leaks are all correct, and I have no reason to doubt them at this stage, the only logical reason to not announce it by now is because they anticipate a lot of double dipping...which is quite likely. Double dipping from PS4/XBox One to Switch (and PC too) is more likely than between PS4 and XBox One. It is definitely gonna be a buggy port. The sales will be down like all the other 3rd party games. Nintendo is making a fool of themselves, go on keep the ports coming...or indies.. or ports and that's the cycle, LOL lets see how you survive your 3rd year. @gcunit i tripple dipped on the binding of issac afterbirth+ poly bridge minecraft prison architect and downwell i double dipped on doom skyrim stardew vally worms wmd and rocket league so what if people want to buy the same game on different systems it doesn't affect u so why does it annoy you? I think you missed the point buddy. Sounds like they are more upset with the fact the game was probably deliberately delayed in order to foster an environment to encourage double-dipping. If that is their sentiment, I completely support it myself. This concept of buy my game now, but then buy it again when you want something simple like portability is incredibly irritating already. Games should not have versions unannounced when they are releasing other platforms, if they are already in the planning stages, it only hurts the customer and the customer trust. Definitely will buy it once it's available on Switch as I never had any of these three games but played two them on the PS1 of a cousin. Perhaps because people doing the double -dipping actively encourages the money interested companies into performing anti customer practices in order to get double-dipping to occur? It's understandable when you're getting sick of a practice, if others are contributing to that practice and actively encouraging companies to do that practice it would irritate you. I hope it will be true!! Does anybody not think this is coming? I’ll probably get it when it does. Wasn’t a huge fan on PS1 and not bothered on PS4/XB1 but just the type of thing I want on the Switch. I see no reason why this game won't see a release on the Nintendo Switch. I have a feeling that this will be announced during the next Nintendo Direct. Eh, I've lost interest. Mario games are better, and I wasn't keen on buying an Activision-published game anyway. I don't have a PS4 or Xbox One so I'll get this if/when it comes. @IHateTombs i really do think it will be digital only, i don't think any of the available switch cards will even fit it, the least it will be half download. At this point, I'm beginning to think that retailers are "accidentally" putting leaks up and taking them down on purpose. This is happening far too often. Yes please. Give me this. Why is this not on Switch yet to begin with? I believe the game may still come just like how Crash did. Activision and Toys For Bob did say a version for Switch is not out of the question just that now they are only focusing on PS4 and Xbox One. The Switch and PC may see this later in 2019, we all know how Nintendo likes to keep things save for the Direct, this collection along with the Metroid Prime Trilogy collection, and the Secret of Mana Collection may be the three surprises we get in the upcoming Nintendo Direct (assuming it's real that is). @Grumblevolcano I'm as cynical as they come, but while I think maybe some smaller studios, and particularly niche studios like Square-Enix with known ultra-fan games like FF milk the double dipping thing, I don't think the big studios (S-E aside) are doing it intentionally for double dipping. The size of the double dipping market isn't even big enough to register as a blip on their balance sheets. I think it has more to do with the fact that they're outsourcing the Switch versions to separate companies that end up with different timelines, and often they need to finish the PC/X1/PS4 "main" versions first (which is usually done after launch these days....) before they have the total asset pool for the outsource to even work on scaling down. It seems like Switch development is inherently managed as "finish the premium version, then take the final product and distill it down for Switch", so Switch inevitably has to launch significantly after "premium" consoles/PC. Just RELEASE the Switch Version already. I’ve waited ages for this.. I was hugely excited for this and Crash Bandicoot. Then I played Crash and it had not aged well in my opinion. Now I’m thinking this may be the case with Spyro. Especially with playing the Skylanders series and enjoying them.. I may check this out if it comes but it will probably be at least a year before I consider buying it ( it’s going to be unnecessarily expensive). @sanderev This. Might grab Crash Team Racing, though! Did they patch out the floss dance yet? Wake me when they did. Between this and the Assassin's Creed thing, a Nintendo Direct seems to be just over the horizon. I desperately want this to be true, as I adore Spyro. Gimme Spyro, a Kingdom Hearts Collection, and Cuphead with this whole Xbox Live crossover thing apparently happening, and that will be literally every exclusive on other platforms that I still want on Switch. I'm sorry, but you'll have to put a bullseye on me then. I wouldn't count it as double-dipping on Switch, but rather the opposite: Xbox One is the one console I double-dipped on, out of impatience and sheer fear the game wouldn't come to Switch. I will give Activision my money twice this year. And will be glad to do so! The like you received on your comment? Mine. Spyro and Kingdom Hearts are the Sony-ish properties I want on Switch the most. Just say you're into Super Mario Maker as well and I will adopt you as my brother. Oddly, I love level editors and wanted a game like Super Mario Maker for years and was extremely excited when it was announced, but I just couldn't get into it for the life of me. I can't explain why. If we get a Switch sequel, I hope my interest will be reinvigorated. I couldn't tell you how many hours I spent making levels in the Mario Flash browser game. I think at the time of SMM I was suffering from a creativity lapse. Which is the same reason I made hundreds of Flipnotes back in the day and agonizingly waited for the release of Flipnote Studio 3D then hardly touched it when it finally came out. So... can we still share the same parents? Oh, I should probably mention I've never actually played Kingdom Hearts since I almost only play on Nintendo hardware (although I played my brother's PlayStation a lot, hence being a Spyro fan), but I've developed a real interest in it as of late and think the games look pretty fantastic. I would love to play them. #[email protected] Because he's a troll. Already got Spyro on PS4, glad I got a PS4 so I didn't have the issue of waiting. Graphics are gorgeous. I do remember Crash Trilogy for Switch was reduced to about one quarter of the size than the PS4 version. Considering how bad Activision messed up this physical release on the PS4 and Xbox One by requiring a huge HUGE chunk of 2 of the 3 games to be downloaded and not putting them on the disc and requiring a 19GB download to complete the games, I can only imagine how bad they would screw up a switch release.... Maybe a 4GB card and then make you download 63GB to your switch. Either way, I'm pretty sure it will require a huge download which pretty much negates a physical release any way. Hopefully they can reduce the size down enough so that the download isn't huge, but I'm pretty sure there will be a sizable download. Why these companies don't just release these compilations as $20 individual games and put the entire game on a card is beyond me. Clearly the physical collectors have shown that they would be willing to pay that to have it all on a disc. I would have done that for the Mega Man Collections and Resident Evil Revelations but instead opted to get them on the PS4. Yes we can, Jesùs. Yes, we can. And yes, I have the same problem with Flipnote, too. That's something that's already happening with Spyro here for a sadly huge lot of people, but I can't blame any of them. Players move on eventually - and if the natural act of outgrowing games had its way with me, I think I might not have played Super Smash Bros. for Nintendo 3DS as much as I did, because I wasn't "young enough" to truly appreciate the thought of a handheld Smash game as much as I did when I wanted it the most, e.g. back in the Melee days, when the GBA was still alive and kicking. I fully realize how impossible this is and won't ask for flying-pigs material any further, however. I was slightly luckier with Spyro in late 2012, when the trilogy eventually came out on the European PSN (at the cost of it being the NA version, completely devoid of the dub which was part of the reason I loved the Spyro games as much as I did when I was a kid), thus enabling portable play via PSP (great console, if only slightly underestimated, underused and misunderstood, though not even close to the same cartoonishly high degree as the Vita). All players have the risk of seeing their dream game come to be when they have already moved on. As for me, I'm hardly going to give the slightest hint of a damn, as I've chosen to straight-up not grow up when it comes to gaming as a whole. I do occasionally appreciate more adult stuff, mind you, but my interest is usually in platformers and generally all-ages stuff much like @Anti-Matter does (I'm right at home with Nintendo, see?). All publishers should at least be aware of that risk. Ill leave this site on my own once i sold my N.switch if this year the same as last. I bought this on Xbox one and I'd buy it again on switch. I can’t wait! I put the Spyro code into Crash Warped and instantly fell in love. I don’t own PS4 or Xbox one, only Nintendo Switch, I not getting a new console for one game. Nintendo Direct tomorrow has to announce this.